As per a study, the average conversion rate for the first time visitor on any website is just 2%. 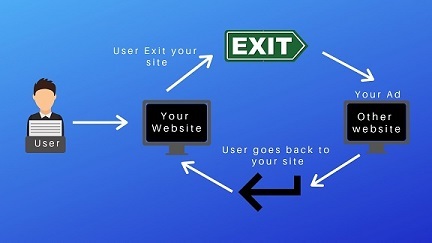 Then what happens to the rest 98% visitors who landed on your website but left it without completing the transaction? Well, you have a marketing technique that allows you to reach those customers again and entice them to visit you and complete the purchase, It’s called Retargeting. Retargeting is to aim and serve ads only to people who have previously visited your website and showed interest in you but not completed any call to action. You tag them with cookies to track their online activity. A cookie is a small piece of data sent from a website that embeds itself in the browser of the user enabling the tracking of the web pages they visit by that website. So when users visit your website you drop a cookie in their browser and now you can target ads to them on other websites they visit attracting them to click through and return to your site. Retargeting provides a huge opportunity for small and medium-sized businesses but many of them are not sure how to do it. It allows your business to focus your efforts on potential customers who have already shown through their previous behavior some kind of interest in your company. In this digital world, it’s actually cheaper and easier to convince people to do something who are already interested in you than others who don’t even know you exist. Retargeting can prove to be very effective for your business if done with a good ad campaign, high-quality content and other strategies that are a part of your complete digital marketing strategy. Retargeting is often confused with Remarketing, so we have tried to differentiate between these two terms here. Both the words refer to marketing techniques that recapture a customer that showed interest in our brand but did not make any purchase. Retargeting is placing tailored ads on other websites or Google network to target people who have visited your website but did not complete the actions you wanted them to by tagging them through cookies. Remarketing basically means re-engaging customers with emails. It’s more like shopping cart abandonment emails and upsells/cross-sells emails. Increase Brand Awareness/Recall: Retargeting is a great way to stay in front of your prospects and keep them aware of your brand. Even if they do not convert right away, your brand will be on top of their mind when they decide to make a purchase. Brand awareness can be huge for business growth and retargeting helps you get exposure from the right prospects. Cost Effective: You can not get the maximum ROI for every penny spent on digital advertising. As the conversion rate in case of retargeted ads is very high you are much likely to get the value out of money spent on the ads. Increased Conversions: Traffic transforms into prospective leads. Encouraging customers to return to your website and connect with the brand helps you nurture leads, hence increasing chances of conversions. Gain Insights: Another benefit of Retargeting is that you can understand where is the higher percentage of retargeted prospects are being found after leaving your website. The analytics of your current and previous retargeting campaigns will create a roadmap for you to decide on your future marketing efforts to bring quality traffic to your website. The effectiveness of retargeting becomes fairly obvious with the straightforward benefits that can be reaped out of it. As the target audience is already interested, the resources invested in the strategy prove to be extremely effective. It also offers great flexibility in the amount of investment, so it can be used by medium-sized and small businesses with bound budgets in advertising. What about you? Have you ever used retargeting in your business? If no then learn more about how retargeting can prove to be the best decision you made for your digital marketing strategy. Just drop us a message or send us an email to learn how you can leverage the benefits of community management.